Marked cards exist ever since people produced playing cards. There's a long long history in this field. First people make small signs with playing cards ink or make some signs by breaking the back of the playing cards. But it's not so good to see the marks when playing poker. Then people study to learn the better ways to mark playing cards. Now with many years working and studying, our company has got the best way to mark Aviator playing cards with invisible ink by machine. That's the result of skills, technology and experience. For the GS marked cards, Aviator marked deck will be a nice choice for people from USA. A original deck of Aviator contains 52 cards and two jokers, blue and red deck of Aviator cards can be marked with black or white marks, they are jumbo index and plastic coated paper material. 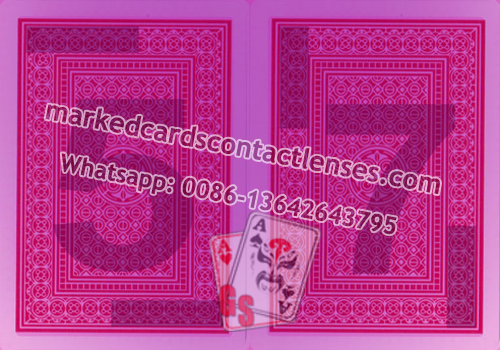 A good pair of contact lenses is necessary for Aviator marked decks because you can not see any invisible ink marks on the deck of Aviator marked cards. That's also quite difficult for others to check the marks.